When my dad and I decided to take a trip to Peru to climb to Machu Picchu, we certainly did not know what we were getting ourselves into. With people from all over the world in all different stages of physical fitness coming to visit the sacred ruins we thought, “it can’t be that hard!” Boy were we in for a surprise. With that being said I 1000% recommend going on this trip and hiking to Machu Picchu. If you want to take the train, that’s great too, but don’t let the physical challenge scare you out of doing the hike. Yes it’s hard, yes there might be a few days where you feel like you might die, but they take such good care of you and the pain doesn’t even halfway compare to the beauty you see around you, and the sense of accomplishment you feel when you summit a mountain or make it to the end knowing that YOU DID IT. Okay, pep talk over, let’s get into the logistics of the hike. We did the 5 day 4 night Salkantay Trek Hike with the company Llama Path. I would recommend going through a tourism company because they make sure you’re safe, carry some of your things and feed you really good food. The quality of your experience will be much better if you have a tour guide helping you along the way. Hiking the Inca Trail to Machu Picchu is more popular, but also is more crowded. Hiking the Salkantay Trail to Machu Picchu is less popular but more scenic meaning you climb with less people and beautiful views. The Inca Trail also fills up really quick so if you haven’t booked your trip 6 months to a year in advance, you might miss getting a spot on this hike. That’s why Salkantay is a great option because it’s usually more flexible. Both are great, it just depends on what you want. When you arrive in Cusco you’ll visit the Llama Path office to get all your information and later the day before your tour begins your tour guide will stop by your hotel to give you all the details and information you need for your trek. My dad and I booked one of their private tour guides, but they have many options for you to join another group or make your own. In our group we had a tour guide, 2 porters (who were also our chef and sous chef) and 2 horsemen who carried all of our sleeping things + 7 kilos of our other stuff. Wake up call was 4:00am with a 4:30am pickup. We drove to Challacancha to start our hike and did a nice steady, flat walk for about 3 hours to our first campsite. When we arrived our porters were making lunch and setting up the tents. We were treated to the yummiest 3 course lunch consisting of cancha, ceviche, soup, stuffed avocados, rice, fish, and veggies. Since we made it to the campsite by lunch, we decided to do an optional hike up the side of the mountain to Salkantay Lake. The hike was very steep and took about 2 hours, but the lake was beautiful. The rest of the evening was spend relaxing and eating dinner. “Senorita coca tea? !” were the words I woke up to at 5am. Our porters brought us piping hot mugs of tea before breakfast at 6am. Pro Tip: when they offer you Coca Tea, TAKE IT. It will help tremendously with the altitude. We started hiking fairly early because day 2 is the longest hardest day. You hike about 4 hours up through Salkantay Pass and then 7 hours down the mountain into the valley. We stopped for an hour for lunch and a few times for water/snacks. I won’t lie to you. This day took it out of me. The path was rocky and you had to be extremely focused to not lose your balance. This day was all about celebrating the little victories. Summiting Salkantay was incredibly rewarding and the views coming down into the valley were indescribable. The important thing about this day is to have grace for yourself and listen to your body. You don’t have to be the first to finish. Remember its not a race, its a trip that you paid to take so take your time, soak in the views and enjoy every moment of YOUR journey. We ended our day at a campsite in Collapapampa with a nice hearty dinner. Day 3 was a breeze compared to Day 2. It was a lot of “Inca Flat” which is steady gains and declines with beautiful views through the rainforest. The scenery was much more luscious and green than the snow and rocks from the day before. We passed through two villages, one with the cutest little puppies. I think this was my favorite part of the entire trip. Best snack break we took the whole time. We broke for lunch at the campsite we were supposed to stay at that evening but decided to switch up our itinerary and camp at the hot springs instead. Day 4 was supposed to be as hard as Day 2 and we just didn’t have it in us so we decided to go relax at the hot springs, camp there and then pick up on Day 4 and go straight to Aguas Calientes, the town beneath Machu Picchu. Looking back, that was a really great decision. Use “Nicole_theNomad” for 20% off any Muzmm backpack. This backpack holds so much stuff and was perfect for my hiking trip. After breakfast we drove to Hidroelectrica and had a nice 4 hour flat walk along the railroad tracks to Aguas Calientes where we were able to check into a hotel and sleep in A BED for the night!! Man oh man a shower has never felt so good!! Sadly we had to say goodbye to our porters and horsemen but our tour guide stayed with us to help us get to Machu Picchu. One more sleep and then we get to go to the ruins! After a much needed nights rest, we woke up bright and chipper to head to Machu Picchu. If you’re taking the bus from Aguas Calientes up to the ruins I recommend getting there earlier than later because a line starts forming and it gets REALLY long. It moves quickly, but just account for that time. Also that means it will be more crowded at Machu Picchu. We left our hotel a little before 6am and it wasn’t too bad. Your tour guide will take you through the main parts of the ruins and give you a lot of really fascinating historical information about the site and then he will leave you to explore on your own. The ruins are incredible and the majestic andes mountains displayed like a painting in the background make the entire view just breathtaking. Definitely take more pictures than you need here because you’ll want to savor these memories. You are on your own after your tour and responsible for getting lunch back in town and making it to your train on time that takes you back to Ollantaytambo from where you will carry on by bust back to Cusco. It’s a long day but Machu Picchu is worth the wait, the hike, the sore legs and tired body. WHOO!! I know that was a lot of info, but I wanted to be as detailed as possible about our experience climbing to Machu Picchu and using Llama Path as our guide because like I said, when I originally researched, I couldn’t find a whole lot online! I’ve linked some of the things I packed with me on my trip that made camping and hiking so much easier. 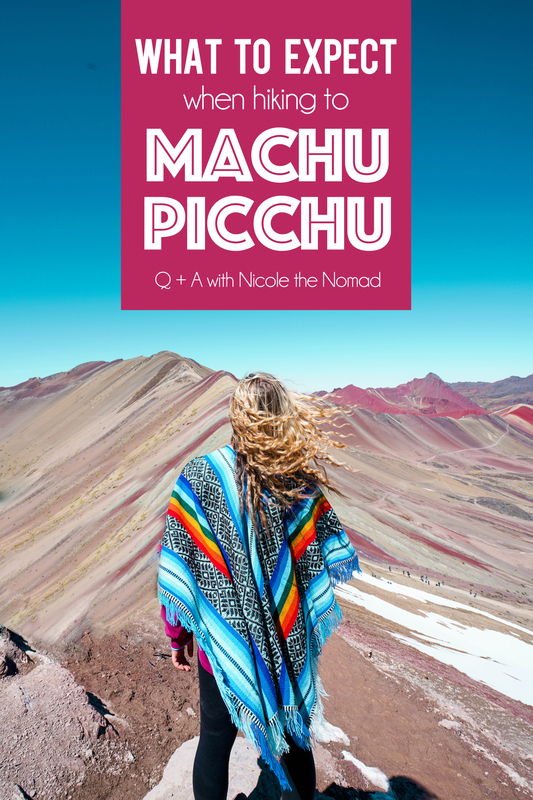 Check out my other blogs on Peru for more tips and things to expect! Thanks so much for reading today, while you’re here join the #DoStuff team on the homepage so you can get more free travel guides, tips and recipes! Check out the vlog I made of our trek with Llama Path! Check out my other articles on Peru!